The Marvel list is up! And what better way to celebrate than with some retro Spidey? 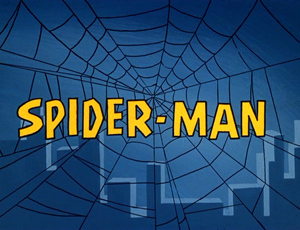 Spider-Man started airing in 1967 and was produced until 1970. Featuring the best TV theme song ever made (seriously, try to get that one out of your head! ), Space Ghost and Scooby Doo style voice-over and plots, and some strange (at times even psychedelic) animation, it’s a show with a lasting legacy that’s still fun today. In fact, I think it’s a lot more fun than most modern cartoons. It’s zany and crazy without making me feel like ADHD in overdrive. And the music is just tops. Groovy! Paul Soles as Spider-Man is something you’ve got to hear, with a deep dramatic voice often slipping into unintentionally(?) hilarious deadpan. I’ll be back tomorrow to make the official rundown for the Marvel list and all the related site updates, for now, have a great night! Enjoy the show!